In The Art of Happiness, now in a 10th anniversary edition with a new introduction from the authors, one of the world’s most effective spiritual leaders teams up with a psychiatrist to share how he achieved his hard-won serenity and how we can find the same inner peace. Whether one believes in religion or not, whether one believes in this religion or that religion, the very purpose of our life is happiness, and the very motion of our life is towards happiness. The Dalai Lama is the spiritual and temporal leader of the Tibetan people-in-exile. In 1989 he was awarded the Nobel Peace Prize. The author of many books and a spiritual teacher respected by millions, he collaborates here with Howard Cutler in his first inspirational book for a general audience. 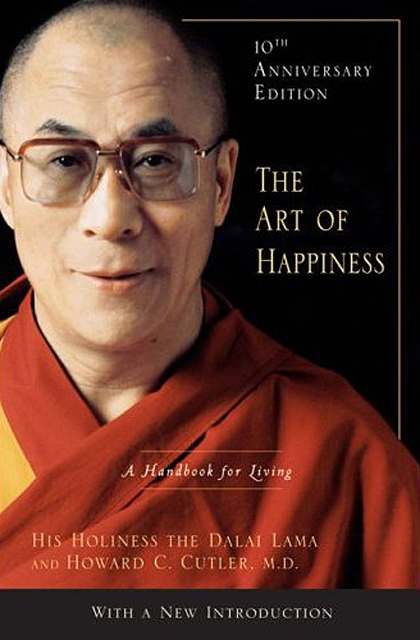 Through meditations, stories, and the meeting of Buddhism and psychology, the Dalai Lama shows us how to defeat day-to-day depression, anxiety, anger, jealousy, or discouragement. He discusses relationships, loss, health, family, and work to show us how to ride through life’s obstacles on a deep and abiding source of inner peace. Based on 2,500 years of Buddhist meditations mixed with a healthy dose of common sense and friendly humour, The Art of Happiness crosses the boundaries of all traditions to help readers with the difficulties common to all human beings. It’s been perhaps the bestselling “Buddhist” book of all time. I am heartened to see that the topic of human happiness is attracting increasing levels of interest and serious research even from the scientific community… Many years ago. I wrote “If you want others to be happy, practice compassion; and if you want yourself to be happy, practice compassion.”… When we help others, the focus of our mind assumes a broader horizon within which we are able to see our own petty problems in a more realistic proportion. "The Art of Happiness" crosses the boundaries of traditions to help readers with difficulties common to all human beings. This updated edition features new material from the Dalai Lama and Dr. Cutler.Nearly every time you see him, he's laughing, or at least smiling. And he makes everyone else around him feel like smiling. He's the Dalai Lama, the spiritual and temporal leader of Tibet, a Nobel Prize winner, and a hugely sought-after speaker and statesman. Why is he so popular? Even after spending only a few minutes in his presence you can't help feeling happier.